The independent wall liner systems combine the features of other metal systems to give high strength and quickly assemble dry linings. They are designed to be installed clear of a variety of existing backgrounds. 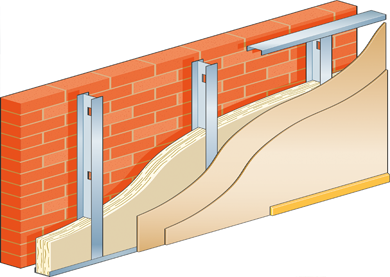 Dry lining reinforced concrete walls, steel framed walls and renovation work where existing walls may form an unsuitable substrate for other systems. Walls must be treated for any damp before installation.